Ph.D. in Hospital Administration is a 3-year doctoral level programme revolving around the field of Healthcare and Hospital Administration. The eligibility for the program is qualifying PG program in Hospital Administration or equivalent examination with a minimum aggregate of 55% and above from a recognized university. Candidates for Ph.D. in Hospital Administration program are selected on the basis of Merit. In addition, they are supposed to take up the various state and national level examination conducted by respective universities and colleges, followed by sessions of counseling/ personal interview and group discussions. The course offers a comprehensive outlook into the field of administration duties carried out in the healthcare sector, thereby preparing candidates in different areas of project development and research. Ph.D. in Hospital Administration offers students an integrated platform for understanding the intricacies of hospital administration and the ways to carry on different functions competently. Those seeking admission to the program requires them to possess certain skills such as leadership, negotiation, working as a team as well as polished communication skills. Having the ability to make quick decisions after reading through details and calculations will render them a platform for developing their research skills, patience, logical reasoning and presenting arguments with ease. The course fee for Ph.D. in Hospital Administration ranges in average between INR 2,000 to 3 lacs for a span of 3 years in India. Doctorates of the program is opened to a wide arena of opportunity in areas concerning Healthcare, e-Health Ventures, Pharmaceutical Firms, Hospital Information Systems, Emergency Medical Units, Universities, Research, Education, Developmental projects and much more. The average income earned by the doctorates after the successful completion of the program ranges from INR 2 to 27 per annum. Top Recruiting Companies Healthcare Sector, Lifestyle Clinics, Hospital Information, Pharmaceutical Firms, etc. Job Positions Administrative Executive, Quality Management Executive, Patient Administration Specialist, Chief Operating Officer, etc. Ph.D. in Hospital Administration: What is it About? 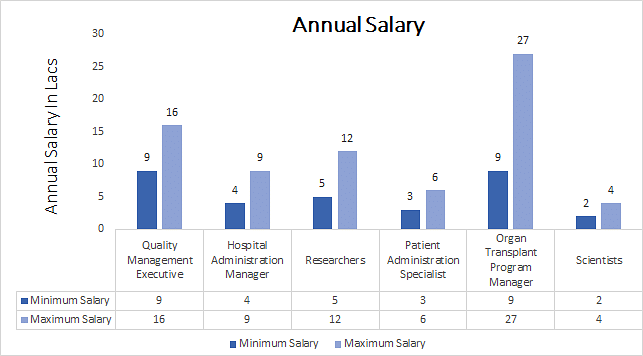 The area of Hospital Administration primarily deals with the aspects related to healthcare and hospital administration. Ph.D. in Hospital Administration renders candidates a platform to explore their knowledge of the field further gaining an advanced perspective in the field. The students learn about the tools and techniques required to run administrative and business work surrounding the healthcare sector. Ph.D. in Hospital Administration program instills in candidates the required characteristics of leadership, managing hospital networks in addition to polishing those related to communication. They are offered a comprehensive platform to better their interpersonal skills requiring them to develop project reports, carry on discussions, and much more. Throughout the program, students gain a perspective of working in team, negotiation, developing reasoning and logical skills, decision making, conducting research, analyzing and evaluating data. The course is structured in a manner wherein the students can gain utmost of skills through the process of lectures and practice. The subject revolves around main subject areas which instills in them the practice of handling mundane administrative work, maintenance, equipment supply, Health Care and Hospital Environment and much more. The other methodologies involved in imparting knowledge of Ph.D. in Hospital Administration course includes presentations, group and individual projects, seminars and discussions with experts in the field. The final year deals with the generation of a thesis on concerned topics working under specialists for guidance. Ph.D. in Hospital Administration imbibes in candidates the expertise of carrying on the administration work with ease and competence opening a myriad of opportunities after the completion of the program. Students are hired in the healthcare sector, pharmaceutical firms, lifestyle clinics, research and development sectors, NGOs, government and private sector hospitals. The overall aim of the program is instilling in students the required skills and competence to emerge as professionals of the field. Applicants should hold a Master's degree or M.Phil in Hospital Administration a minimum of 55% aggregate and above from a recognized university. They should have relevant work experience of 5 years as professionals in a senior position. Some of the reputed colleges and universities may conduct interviews for selection of candidates. Admission to Ph.D. in Hospital Administration is done on the basis of merit secured in the qualifying examination. The eligibility criteria require candidates to hold a relevant Master’s degree or M.Phil in Hospital Management or equivalent examination with a minimum of 55% marks and above from a recognized university. The students are supposed to pass the entrance test held by various universities and colleges which will be followed by Personal Interview and Group Discussion to gain an insight into the student’s personality traits. However, the eligibility criteria is subject to vary as per the norms prescribed by different colleges. The cumulative marks obtained in qualifying exams, entrance test, PI, and GD will be calculated to count the merit cut-off for different universities. Applicants can apply forPh.D. in Hospital Administration either offline or by visiting the official website of the respective colleges. All the important information pertaining to the date for admission, entrance test and other such will be notified through email or listed on the official website. Ph.D. in Hospital Administration course enables candidates to gain a detailed overview of candidates with the advanced knowledge of the field. The covers acquaint them with the latest developments in the field along with instilling them the necessity for conducting research. Candidates after the successful completion of Ph.D. in Hospital Administration course have a wide arena of prospects on the career front. They have employment options in areas of Healthcare Sector, Lifestyle Clinics, Hospital Information, Pharmaceutical Firms, Research and Development, Educational sectors and much more. They can become Marketing Executive, Hospital Administration Manager, Organ Transplant Program Manager, Clinical Administration Manager, Administrative Executive, Quality Management Executive, Patient Administration Specialist, Chief Operating Officer, Chief Clinical Officer, Clinical Nurse Manager and much more.